The proliferation of mobile devices poses a challenge for IT decision makers. A key component in evaluating the appropriate devices for their workforce is the total cost of ownership. They must find the balance between low costs, consistency with IT policies and meeting the needs of the users. The TCO is integral to finding the return on investment for mobile devices. The Voq professional phone is a new class of mobile phone that offers a flip-open QWERTY thumbpad, and easy-to-use software solutions for business users, including secure, serverless, always thereTM e-mail. 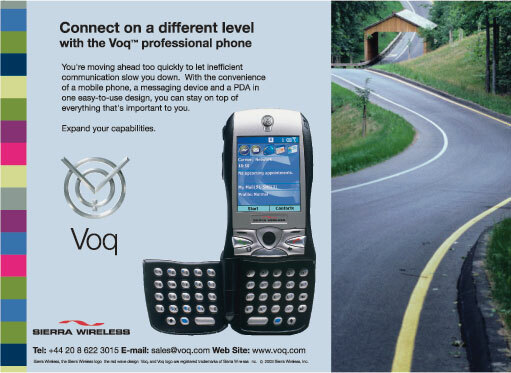 Based on the Microsoft Windows Mobile™ 2003 software for Smartphone, the Voq professional phone incorporates the best features of your current mobile phone, a messaging device and a PDA – in a single, compelling phone. Many mobile professionals carry multiple devices – their cell phone, messaging device and PDA. These capital purchases can easily exceed $2,000USD. To help address both the needs of the end user and reduce costs for the purchaser, the Voq professional phone delivers the perfect combination of all three of these devices without sacrificing features or usability. The business user may now carry one device with them instead of juggling three. For the IT department, having one device instead of three results in an immediate reduction in capital expenditures. Each device that is purchased requires enterprise IT management support (e.g., provisioning and configuration, troubleshooting, and repair/maintenance). Purchasing one Voq professional phone instead of multiple devices, results in a reduction in both time and cost for an IT team, allowing them to focus their efforts on other tasks. This is also true of the Voq professional phone. However, other wireless e-mail solutions require a hosted server to be maintained on the Internet, or at a wireless network operator’s site. This gateway provides an interconnection between the wireless network operator’s infrastructure, and the enterprise firewall to support e-mail delivery, which imposes an additional monthly e-mail service fee. This may increase costs by as much as $30USD per month per enterprise user. VoqMail™ Professional Edition (VoqMail Pro) is an e-mail solution bundled with the Voq professional phone that does not require a hosted server or a monthly e-mail service fee. Enterprise IT teams have already made an investment in e-mail servers, such as Microsoft Exchange or Lotus Notes, in order to deliver e-mail to and from desktop PCs and portable laptops. Many other wireless e-mail solutions require an additional investment in a wireless e-mail server (middleware) to be installed behind the enterprise firewall. This requires a purchase of new server hardware and wireless e-mail server software. This software may incur fees for both the enterprise server software and per-client (per seat) fees. This can quickly become very costly, reducing or eliminating the cost savings expected from the resulting increased productivity. Unlike these other wireless e-mail solutions, the Voq professional phone does not require wireless e-mail servers behind the firewall. Therefore, these costs are eliminated. Some handsets require desktop redirector software to forward e-mail to the wireless phone. This requires the installation of software on the user’s desktop PC, and also requires the PC to be left running while the user is out of the office – something that is not always possible for the mobile professional. To support and maintain this desktop software, the IT team is often required to physically go to each desktop to resolve issues with software installation, troubleshoot forwarding issues, and answer general configuration questions. This can place a strain on IT resources. This problem is further complicated in large organizations where PCs are disparately located. This requirement of desktop redirector software is removed when deploying VoqMail Pro for the Voq professional phone since VoqMail Pro connects directly through the corporate firewall to the e-mail server. The desktop PC is not required to be operating while the user sends and receives e-mail wirelessly. Therefore, the IT maintenance costs are significantly reduced. By eliminating multiple wireless devices, the purchase of a Voq professional translates into fewer wireless accounts to manage on a monthly basis. By consolidating voice and data costs onto one single bill, accounting costs are also reduced. The process of approving and paying wireless bills is streamlined. Other competing solutions implement third party security solutions (e.g., end-to-end encryption). These third party security solutions, while secure, differ from the enterprise’s existing VPN security policies, and, therefore, require testing and eventual approval. In some cases, the internal policy must be compromised or waived in order to accept the security methodology. VoqMail Pro leverages the existing enterprise VPN gateway, thus reducing the cost and time it takes to evaluate the security implementation and methodology. The Voq professional phone runs on the Windows Mobile 2003 software for Smartphone. This operating system provides an easy way to update and maintain devices wirelessly and is architected to support remote configuration and maintenance by the IT department. There are many aftermarket solutions that support the maintenance and provisioning of Windows Mobile devices. This allows enterprises to implement a device management solution that from a single user interface will support Windows Mobile 2003 devices, PDAs with competitive operating systems, and desktop PCs. This eliminates the need to implement and train enterprise IT managers on a proprietary device management solution that supports only a single type of handset. Designed for the mobile professional, the Voq professional phone also offers a lower total cost of ownership than competing mobile devices making it a more attractive option for the enterprise.